Anne Dixon, MD, can quote the statistic without a second thought: “Approximately 250,000 new cases of asthma per year in the U.S. are related to obesity,” she says in a phone conversation from her office at Fletcher Allen Healthcare and the University of Vermont. For over a decade, Dr. Dixon has led translational research and clinical trials to better understand the link between obesity and asthma and fill the gaps. At Vermont, Dr. Dixon is director of the Division of Pulmonary and Critical Care Medicine, a sizable clinical and research and teaching division with 17 MDs and four PhDs. 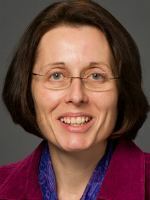 She is also professor of medicine and director of Clinical Research at the Vermont Lung Center. Dr. Dixon is also principal investigator of a recently completed Study of Asthma and Nasal Steroids (STAN), which is a multicenter, randomized, placebo-controlled trial to determine the efficacy and mechanisms of action of nasal steroids in the treatment of asthma. The study, which examined 380 adults and children, is performed through the American Lung Association Asthma Clinical Research Center network. Dr. Dixon counts among her mentors Dr. Parsons, Charles Irvin, PhD, director of the Vermont Lung Center, and pulmonologist Joan G. Clark, MD, of the Fred Hutchinson Cancer Research Center, also where Dr. Dixon served as an instructor following her fellowship in pulmonary and critical care medicine at the University of Washington in Seattle. Dr. Dixon arrived with an international perspective. Originally hailing from Plymouth, England, Dr. Dixon earned her undergraduate and graduate degrees from Cambridge and Oxford universities, and also completed an internship in England. She then relocated, completing her residency in internal medicine at Johns Hopkins Hospital in Baltimore. “I came the old fashioned way—my husband’s American,” Dr. Dixon says with a laugh. With her husband, Dr. Dixon raises a 16-year-old son and a 13-year-old daughter. Taking advantage of her state’s many outdoor offerings, Dr. Dixon and her family hike, kayak, and ski. “They keep me on my toes and they keep me grounded as well,” Dr. Dixon says.